The reality is that unlike some prolific bloggers (yes Lladybird, I’m looking at you), I can only sew on weekends. And even then not the whole weekend (hello power cuts…). So between monday and friday, I usually get excited about projects and the one the most recent excitement is usually the one that receives attention over the weekend. 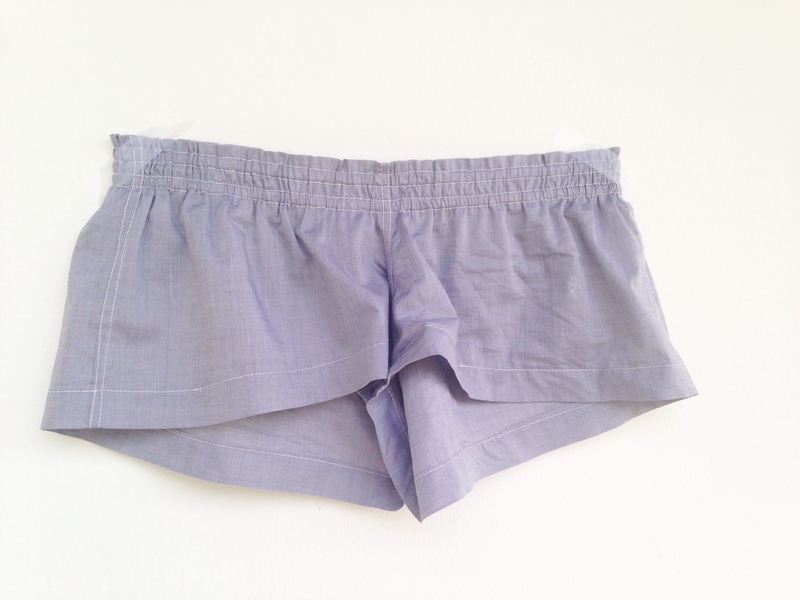 Going back to sleepwear, I then remembered the cute cute version the free Colette Madeleine bloomers made by Peneloping. What she talks about in her post is exactly what happened, a pattern you looked at a million times, even printed and taped but suddenly YEARS LATER, you need to make it. And you need to make it NOW. I went to Pattern Review to check the comments because I remembered some useful insights about the fit. 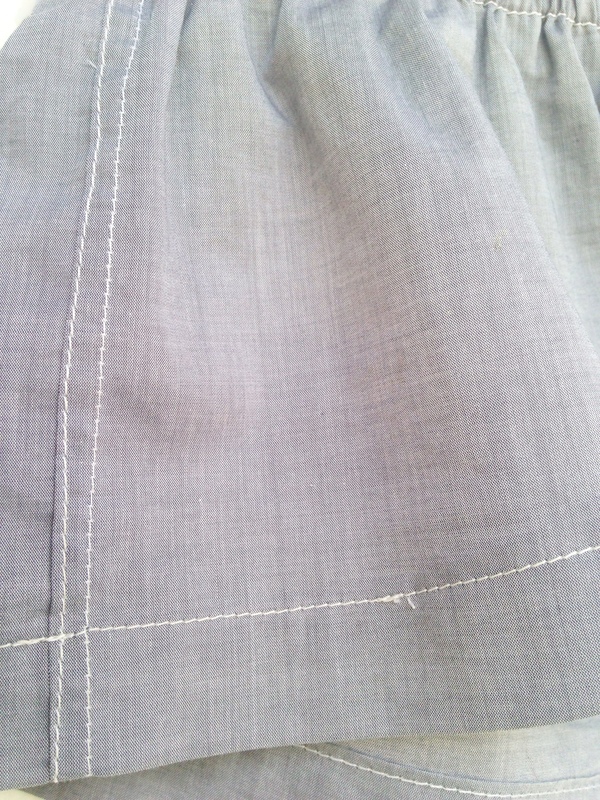 Reviewers mention the very low waist, which is what I wanted, and the lack of coverage, but considering that I was going to sew an XS, I figured it would be ok.
As you can see, it is not bloomers at all. Call me weird but I could not imagine sleeping with ribbon tying my thighs… That required some pattern adjustment which I will probably detail in another post, as I plan to make another pair very soon (this weekend if I don’t get distracted by friday!). For this test version I used a Theory shirting cotton that I bought in Moods while still living in NYC. 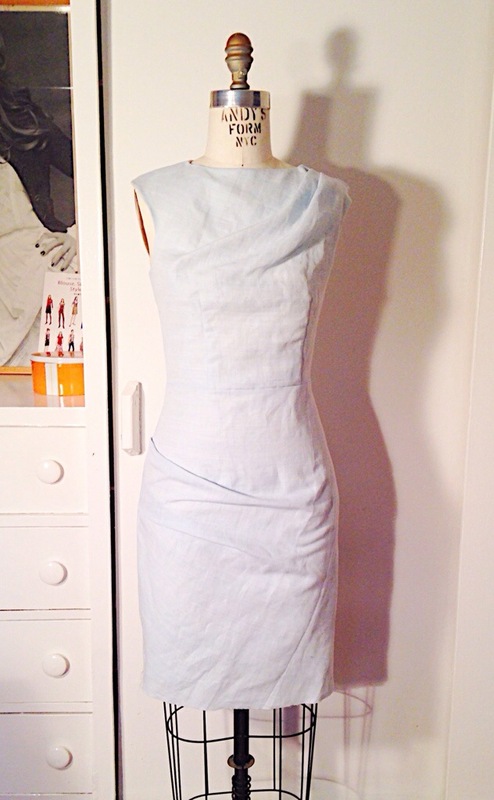 I used flat-felled seams everywhere and the whole process from taping to hemming took less than 2 hours. Bonus, The Old Man loves them (understatement). Extra bonus, they are comfortable and I’ve been wearing them every night (and day, humhum #sundayinyourpjs…). Now, on sunday I’ve been good and I dedicated all my sewing time to Lekala 4362. After quite some work and alterations, this is where we are. I will write a whole post about my modifications for this pattern so stay tuned! Wow, the lekala looks AMAzing! Gosh I relate. This Winter holidays I’ve spent too much time thinking about what to sew and changing my mind that I’ve barely sewn at all…. too many shiny things to distract me. And all plans were thrown out the window to cut and Alder last night…. Your dress is stunning! I love the light fabric you chose for it, beautiful! Thank you! Your comment made me laugh a lot, it’s the first time i hear congratulations for blogging irregularly! Good grief, THAT DRESS. I gasped with delight. Gasped. You’re not helping with my scattered sewing/blogging/life focus at. all. Blame it all on me. That´s fine. BUT NOW GO AND WRITE A BLOGPOST ABOUT VINTAGE DRESSING ADVICE. Thanks. Twist my arm, why don’t you! I got stalled because a reader, Jenifer, made a comment about the link between value and durability, and now I just have to slink around vintage dress shops trying to harass people into talking to me about this, as I haven’t got the experience to fully address her comment. That, and your Lekala dress has ruined all of my other sewing plans. Yup. Still blaming you. Evil Jenifer and evil you, for that i had to go back to your post and read her long and deceptively constructive comment. I’m off to sending you an email with some links on garment quality. That will be my revenge. I really resent how smart my readers and commenters are. I’d have so many more posts and reply to comments with so much more speed if you all weren’t downright cruel with your genius.